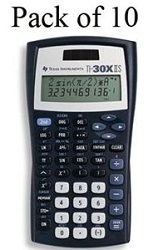 Designed for basic math and trigonometric functions, the Texas Instruments TI-30X IIS scientific calculator gives you the tool you need to ace frustrating math classes, including algebra, general math, geometry, trigonometry, statistics, and physics. Its two-line scrolling display gives you the ability to calculate complex formulas. The calculator offers an easy-to-use conversion feature, allowing you to quickly find the values you need at crucial moments. The Texas Instruments TI-30X IIS scientific calculator allows you to review previous entries, making finding patterns quick and easy. You can enter, delete, and edit individual statistical data elements with the calculator, ensuring you always have an accurate computation. The calculator even recognizes the symbolic value of pi in radian mode, making complex computations a breeze. 1 teacher's guide in English and Spanish.